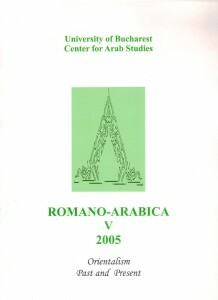 Click HERE to access Romano-Arabica V.
Ibrahim ben Mrad (ed. ), Proceedings of the Fifth International Colloquium of Lexicology Organized by ALAT on Lexical Semantic. (Nicolae Dobrişan). Iranian – Arab Affairs quarterly (Irān wa al–‘Arab faṣliyya) no. 6-7, 2003-2004. Nadia Anghelescu (ed.) and George Grigore (a.ed. ), Romano-Arabica V, Orientalism. Past and Present, 2005, Center for Arab Studies. Bucharest: Editura Universităţii din Bucureşti.